The Pierre du Bois Annual Lecture is co-organized in partnership with the Graduate Institute. The lecture, which was attended by more than 250 people, was a great success! Please click here to watch the video. Mr Krastev’s lecture looked at Russian military intervention in Syria and how it is provoking Western puzzlement about Vladimir Putin’s strategic intentions. In a disruptive world which is no longer defined by East-West dynamics, how should we interpret Russia’s strategic behavior and the inner logic of Mr. Putin’s regime? 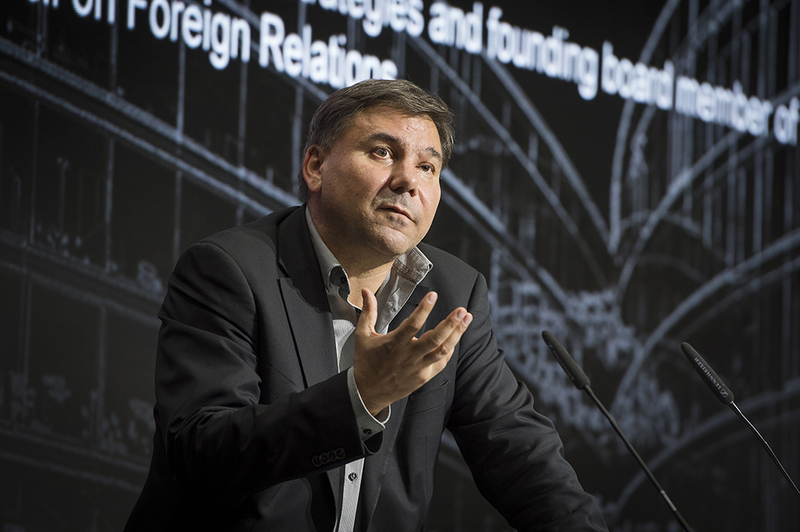 The 2015 Pierre du Bois Annual Lecture was given by Ivan Krastev, Chairman of the Centre for Liberal Strategies, and founding board member of the European Council on Foreign Relations. His career has spanned a large number of countries and institutions, and he has made many significant contributions to conceptions of European and global politics. In the 2015 annual lecture, Ivan Krastev chose to speak on the issue of ‘Russia and the West’, a relationship he intriguingly termed ‘the Imitation Game’. 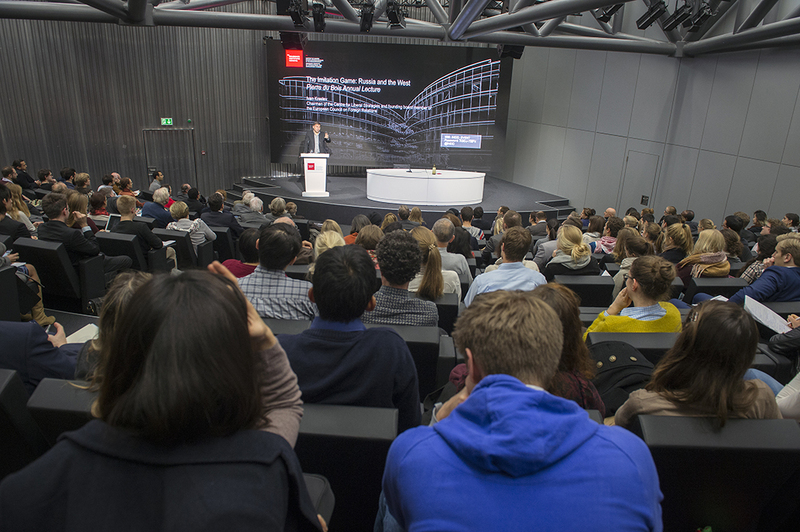 He offered an animated and engrossing address, putting forward a challenging argument to his critically trained audience of students, professors, and citizens. Russia, he argued, knows the West better than the West knows Russia. The Russians wanted to ‘live like the West’; it was a model to emulate, and therefore knowledge of its intricacies was indispensable, and desirable. This invested interest was a one-way road. As a result, Mr Krastev suggested that The West remained unsure of how to consider post-Cold War Russia and tended to reduce Russian behaviour to an interpretation of President Putin’s mind. The Yugoslavia crisis was the turning point in these relations, with Russia’s views on the West changing from mostly positive, to negative. Part of the Russian foreign policy can be explained as reverse-engineering. By mirroring Western actions, its basic strategy has been the de-legitimizing of the international order by imitating the West that is ‘acting’, rather than the one that is ‘talking’. The West tended to moralize others, while rarely putting their preaching to practice. This also gives a subtle meaning to the idea of Russia as a ‘spoiler power’, namely a pedagogical one, which strives to teach others a lesson by imitating their actions so that their perspective is better understood. The rationale behind these actions is that the current international system is too dominated by the West, and this is a major obstacle to Russia’s interests. On the other hand Russia’s geopolitical power is not sufficiently developed for it to be the power it wants to be. Through the rigging of elections for which the results were in any case ascertained (given the lack of viable opposition), and the dramatization of the lies the state told to its people, Russia has continued to satirically provoke the Western world and the liberal morals for which it stands, jarring with the West’s often conservative actions, Mr. Krastev proposed. The Soviet understanding of democracy in the West was that both the freedom of speech and democracy were a farce, and they served the interests of the elite alone. A great deal of protesters in the West today, Krastev claimed, would agree. By juxtaposing Soviet impressions of the West, with Western impressions of Russia today, derived, and still not divorced from a Cold War past, Kastev presented the sharp tip of the iceberg of relations that the west has yet to uncover. His speech was followed by a lively debate, with some students proposing counter-examples of Russian policy to add nuance to the debate, while others brought in a more international angle, referencing other emerging powers and how Russia related to them.